DECKER Protect – This is a new DECKER range, 3rd Generation co-extrusion capped composite decking boards with wood grain and matte brushed finishes. Newly introduced for 2018. Latest technology is applied by bonding a protective coating on the outside of a wood plastic composite core to eliminate fading and staining problems of uncoated wpc decking. 140mm x 23mm with channelled edges. We have started selling the Decker Protect range of co-extruded composite decking in 2018. 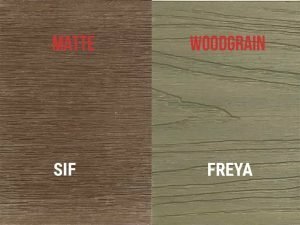 Initially, we have set a colour range of six different colours, broadly a beige, mid brown and dark brown and light, mid and dark grey. Our Decker Protect colour range and the “Norse God” colour naming is set out below. Capped or Co-extruded composite decking is guaranteed not to fade. There is minimal colour change between manufactured batches. Each board has two finishes, MATTE finish, which is a brushed or sanded finish on one side, and a WOODGRAIN embossed finish on the other. Boards can be laid either way up. The DECKER Protect co-extruded composite decking comprises two bonded materials. The co-extrusion capping is a Polyolefin coating. This is bonded to the solid core through the manufacturing process. The solid core is manufactured on the basis of approximately 60% recycled wood fibre and 30% recycled “ Grade A” HDPE. The remaining 10% comprises additives (non-toxic, non-invasive) including colourants, UV stabilisers, anti-oxidants, lubricants and binding agents. We only supply decking, we do not install. Our “Invisi-Clip hidden fitting system is really easy and quick. The installation fittings are more fully described here. If you are looking for an installer for your decking, we do have installers in some areas who we would recommend, so please ask. Finish off your deck with a matching Fascia Board. We have a square edged co-extruded solid board especially for fascias around your deck. Available in 3.6m lengths, these boards are 100mm wide, 12mm thick. Can be face fixed. We would like to help you plan and build a beautiful outdoor living space. If you want to check the colour or quality of our product, we can express post you free samples. If you want to know how much your decking might cost, we can provide you with a free quote. If you have any other questions about our product or the buying process, you can contact us through our webform, by email or by phone. DECKER composite products are manufactured and distributed by Venture Products Pty Ltd.